Christos Takoudis received his Diploma in Chemical Engineering from the Ethniko Metsovio Polytexneio (National Technical University of Athens) and his PhD in Chemical Engineering from the University of Minnesota, Twin Cities in 1981. He joined Purdue University that same year. In 1996, he moved to the University of Illinois at Chicago (UIC). 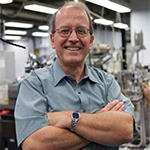 He has been doing work on atomic layer deposition (ALD), and he pioneered inherently selective ALD; he has been at the forefront of hybrid ALD/CVD (Chemical Vapor Deposition) systems with applications in nanoelectronics, biomedical implants, and other nanotechnology fields. Also, he has been an evaluator of research and educational programs at the undergraduate and graduate levels in South Korea, Finland, the Czech Republic, Israel, Greece and Ireland. He is currently a professor in the Chemical Engineering and Bioengineering Departments at UIC. He has been the major professor of about 40 PhD students who now teach and work all over the globe. He likes to play music as much as possible. He has been on several Boards of Greek-American organizations.